Mysterious treasures have been found in the Khrysos galaxy! Collectors, adventurers and treasure hunters from distant worlds are all racing to make their foturne. Assemble your team and use their unique skills to battle, confound, and steal from your opponents. Be the first team to collect the treasures to win. Enjoy millions of map combinations and a huge variety of characters to experience within this base game which is expandable up to 6 players. 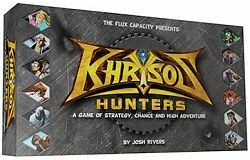 This hybrid card/board game is a fast, fun, action packed romp that has players move their treasure hunters around a changeable map to be the first to collect 12 treasures. Each turn is initiated by a die roll but each of the colourful characters will play using a different strategy by leveraging 1 of their 6 abilities.